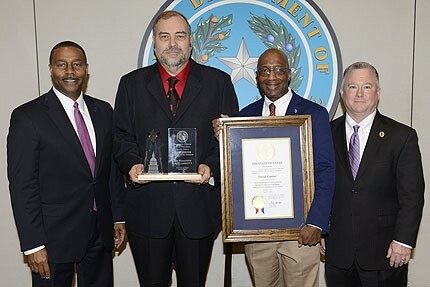 The 24th Annual Texas Governor's Criminal Justice Volunteer Service Awards were presented in Austin on April 5th. David Gunter, Executive Director of Less Than The Least (LTTL) Ministries, was presented the Religious Service Volunteer Award. His award bio read in part, "Mr. Gunter emphasizes the need to reach incarcerated individuals with the gospel of Jesus Christ and to encourage spiritual growth. His efforts and dedication led to him being selected as the recipient of this award." David has stressed to everyone that this award is for all who are associated with Less Than The Least Ministries. Indeed, this award should encourage all LTTL volunteers and supporters and challenge us to remain faithful. From left to right: TBCJ Chairman Dale Wainwright, David Gunter, Texas State Representative James White, and TDCJ Executive Director Bryan Collier.